2012 was a year of many things, but among the highlights is the discovery of this new species of bat. Commonly known (for those in the know) as the Diabolic Tube-nosed Bat, this adorable little mammal has the Latin name of Murina beelzebub. It lives in tropical Vietnam, and belongs to the family known as Vespertillonidae or Vesper Bats. Discovered in 2011, “We chose the name Beelzebub to reflect the dark ‘diabolic’ coloration of the new species and its fierce protective behaviour in the field,” Gabor Csorba, of the Hungarian Natural History Museum, said in a statement. 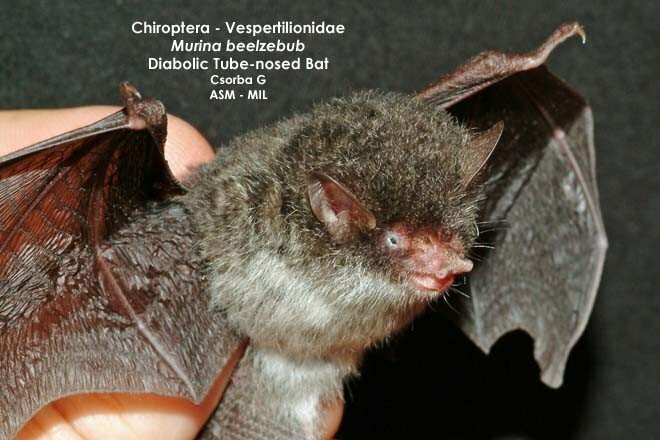 This entry was tagged bats, murina beelzebub, new species of bat discovered, tube nosed bats. Bookmark the permalink.